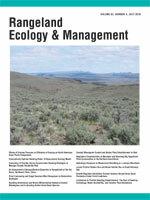 Rangeland Ecology & Management publishes all topics-including ecology, management, socioeconomic and policy-pertaining to global rangelands. The journal’s mission is to inform academics, ecosystem managers and policy makers of science-based information to promote sound rangeland stewardship. Author submissions are published in five manuscript categories : original research papers, high-profile forum topics, concept syntheses, as well as research and technical notes. Rangelands represent approximately 50% of the Earth’s land area and provision multiple ecosystem services for large human populations. This expansive and diverse land area functions as coupled human-ecological systems. Knowledge of both social and biophysical system components and their interactions represent the foundation for informed rangeland stewardship. Rangeland Ecology & Management uniquely integrates information from multiple system components to address current and pending challenges confronting global rangelands.